The senior BJP leader refused comment when asked about the interviews given by Congress president-elect Rahul Gandhi to television channels in Gujarat. A file photo of BJP delegation led by Kailash Vijaywargiya National General Secretary of Bharatiya Janata Party with others. 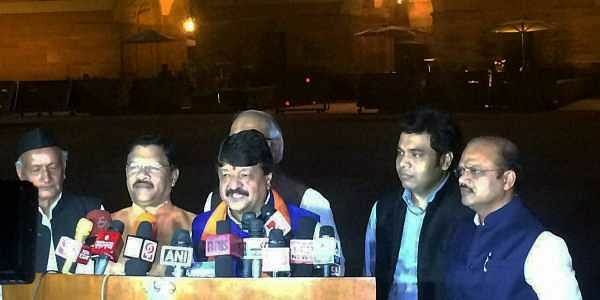 INDORE: On the concluding day of Gujarat polls, BJP general secretary Kailash Vijaywargiya today predicted that the BJP will win 150 seats. "We have set a target of winning 150 seats in Gujarat assembly elections and the party would get that much seats," Vijaywargiya told reporters. The senior BJP leader refused comment when asked about the interviews given by Congress president-elect Rahul Gandhi to television channels in Gujarat ahead of the last phase of polling. "I won't comment as the Election Commission has issued a notice (to Gandhi). However, newly-elected Congress president should understand appropriate time for giving an interview. If he doesn't have this much of political understanding, then are we responsible for it?" he asked, referring to the BJP's complaint to EC. Taking a dig at Gandhi's unopposed election as Congress president, Vijaywargiya said, "It is a matter of happiness that he (Rahul Gandhi) has started visiting temples. In the entire Gujarat elections, he did not wear a round (skull) cap during canvassing. It is a matter of happiness for the country".